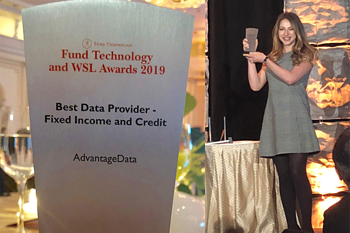 Advantage Data Inc. (ADI), a leading fixed income pricing and analytics provider, today announced that it has been named Best Data Provider — Fixed Income and Credit at the 2019 Fund Technology & WSL (Wall Street Letter) Awards. The eighth annual award ceremony, organized by Pageant Media, recognized providers catering to asset managers and institutional traders who have demonstrated exceptional customer service and innovative product development over the past 12 months. Advantage Data has a history of excellence in the financial services industry spanning over two decades. With 16 products and services, ADI shines a bright light on data within opaque credit markets — providing the tools and data for investment bankers and asset managers to analyze the credit market on a global scale and to increase the accuracy and efficiency of their market data. Previously known as the WSL Institutional Trading Awards, the February 6th event highlighted the efforts of technology providers, broker dealers, data specialists and exchanges in meeting the needs of the asset management community. For more information about the Fund Technology & WSL Awards, please visit https://fundtechnologyawards.awardstage.com/. Founded in 1997, Advantage Data has been providing credit and credit derivative pricing, descriptive, financial and analytical information to the world’s top financial institutions for more than two decades. Advantage Data’s workstation provides access to a powerful, comprehensive and global fixed-income platform. Sell and buy-side fixed income analysts, traders, portfolio managers and risk management professionals rely on Advantage Data every day to access quality data quickly and easily. Likewise, banks, brokers, mutual funds, hedge funds, asset managers and insurance companies utilize the Advantage Data feeds services for end of day valuation, research, and compliance functions. For more information about Advantage Data, please visit https://advantagedata.com/.